Picking cabinets was fairly easy; for photography purposes I knew I wanted white so it would be light and bright. I also knew I wanted a gigantic island; this one is about 9 feet long by 5 1/2 feet wide with a granite top. I also wanted a great spot surrounded by windows to snap pics of all the food we make around here. We picked a soft gray for the walls (Sherwin Williams ‘Sensible Hue’); it’s actually one shade darker than the gray we painted the rest of the house. The floors are an engineered hard wood. Yes, the dark wood shows crumbs and dust much more than a lighter wood, but on the flip side, that actually makes me keep my floors clean and sweep more than once a week like at my old house. Seriously. I love the warmth the dark floors bring to the house. They also have a hand-scraped texture that adds character and makes me not care about any dings since it’s blends right in. The cabinets are painted Sherwin Williams ‘Snow Bound’ and glazed in ‘Van Dyke’ stain for that dark highlight. I went back and forth and back and forth on whether I wanted them glazed and I’m really glad my husband, builder, and cabinet guy talked me into glazing; I love the dimension it adds and the detail it highlights. I also love the white cabinets and haven’t had any issues with them being hard to keep clean (like some people warned me about). Sometimes the cupboards we use the very most get finger prints on them, but all it takes is a quick wipe to clean them right up. I’m glad I went with white. For contrast, we painted the island black. All of the appliances on the back-side have panel fronts on them so they look like cabinets. Hiding right there in the cabinet next to the pull-out garbage is my most favorite appliance, ever. You’re going to have to wait to see it! When it comes to home decor I employ the same tactics as my wardrobe. Splurge on some nice expensive things, and balance out with some bargains! For example, we splurged on a granite upgrade that I loved, but found this great glass and marble backsplash tile at Costco for a fraction of what similar styles cost. 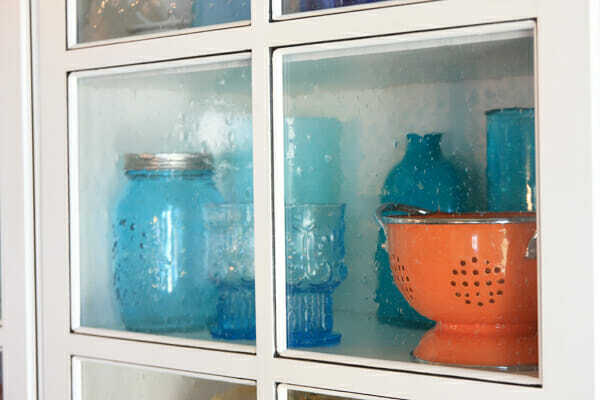 I love that the clear glass has a blueish tint that goes well with all of the blue/turquoise accents in my kitchen. And the rest of my house. And my wardrobe. I have an obsession. One thing I knew I wanted from the beginning was some metal tile. 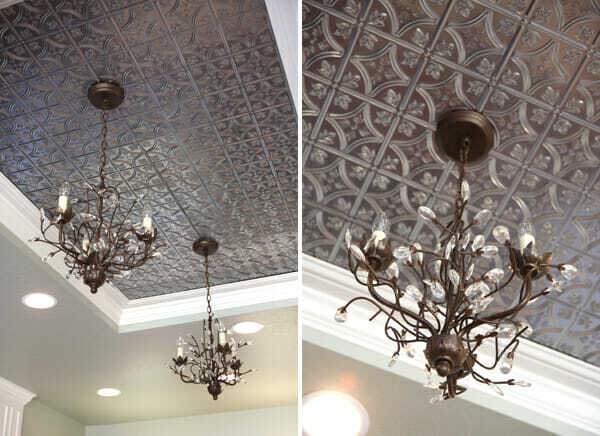 I’ve always loved it, but didn’t want to overdo it with an entire backsplash or ceiling. So I used a simple section above my stove and I love how it blends with all of the stainless steel appliances in the kitchen. I also had the idea to do a recessed panel centered above the island. This is one of my favorite parts- and I feel cool and designer-ish for thinking of it myself, designing it out, and seeing it happen! Metal tiles can be crazy expensive, but I special ordered these from Home Depot for about $35 per 2’x4′ panel. They have faux plastic ones for almost that much, so I think the metal is quite a steal. 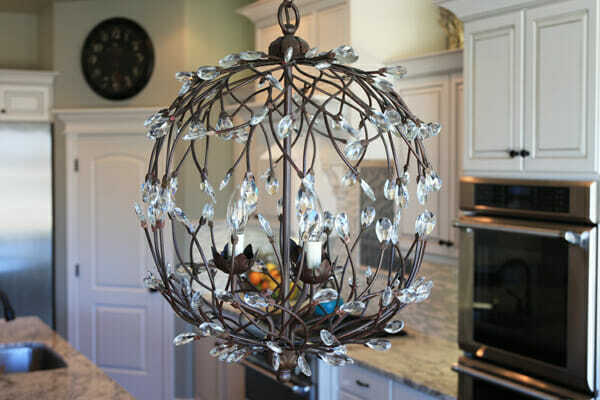 Those mini chandeliers hanging over the island are from the Camilla line at Pottery Barn (which I got at a bargain during their annual lighting event). 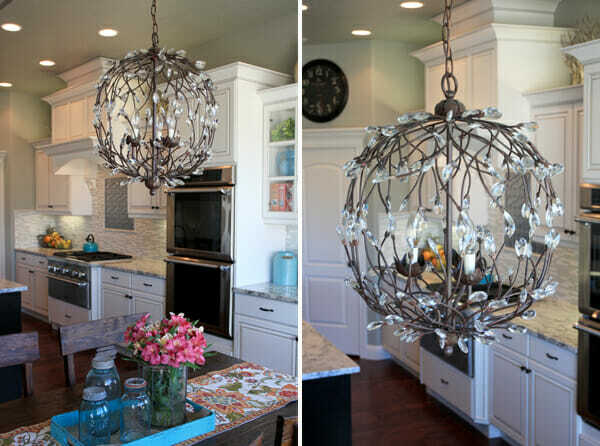 We have the large version in our entry way, and the globe light (seen later in this post) over our dining table. LOVE them. This is me saying, “Hi everyone!” Obviously. I have a few single ones as well; I just thought they were cool. I honestly stuck them up there temporarily because I wasn’t sure where I was going to put them and wanted them out of the way, and they’ve just stayed! I almost did an apron front sink but decided I just wanted a nice big under-mount basin with no dividers. I love having one big, deep spot to pile in dishes and large pots and pans. The island has chunky legs (resisting so many puns right now…) and those stools are from Ikea. We actually bought the super high ones on accident. We got them on a trip to Utah, so there was so exchanging happening. However as it turns out they are the perfect height for the little people around here. It turned out to be such a happy accident. And adults can fit comfortably on them too, even though they feel higher than normal. We eat a lot of our meals at the island so it’s perfect. Another thing I made sure to do was take advantage of every space available. I wanted nothing wasted. So there are big giant cabinets under the island for stowing away things I don’t access very often. And nice deep shelves for my appliance addiction. They’re hidden panels I can grab with my foot and fit about 4792 spice bottles. Having all of the spices in there frees up tons of space in the upper cabinets. Speaking of storage, people tend to assume I have a massive pantry, but it’s totally average-sized. 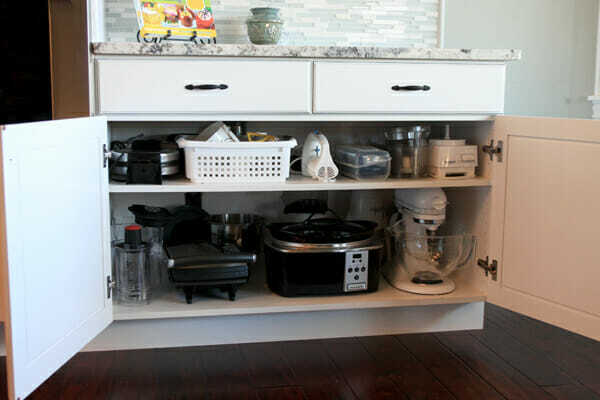 I found with a large pantry at my previous house that it just got used up with storage, and I’d much rather have that space used outside the pantry. So I have a huge separate storage room nearby and tons of shelves in the garage where I can store big stuff. One thing I did do however, was make some extra tall shelves with electric outlets to keep the appliances I use regularly (like my toaster and my blender.) I have this thing with cluttered counter tops and I hate having appliances sit out. I also hate pulling things out over and over again. This has seriously been the most convenient thing. This pantry shelf (and the rest of it that you can’t see in this photo) become an extension of the kitchen that we use all the time. I made sure to do a few cabinets with bubble glass fronts to let some of my pretties peek through- like my wedding china that finally got removed from their boxes after almost 9 years of marriage. Yes! And my collection of blue glass. Everything turned out as lovely as I imagined it, and for that I am happy. Here’s the other Camilla light- the globe version. My favorite thing about this light, is that as the afternoon sun goes down and shines though the window, it casts sparkly little rainbows all over the house. Watching my little kids chase those around is priceless. I hope you all enjoyed the little peek into my home; I wish I could have you all sit down for dinner! Here’s a list of specs, if you have other questions, about anything, feel free to ask in the comment section! Glass and Marble Backsplash: Costco find! Granite: I totally drew a blank, I’ll be back with the name of the granite! I have been WAITING for this post! So gorgeous! Beautiful!! Wow, I’m wishing mine looked like that!! LOL And I’m married to a fabulous cabinet guy!!! (who would have totally talked you into the glaze too). 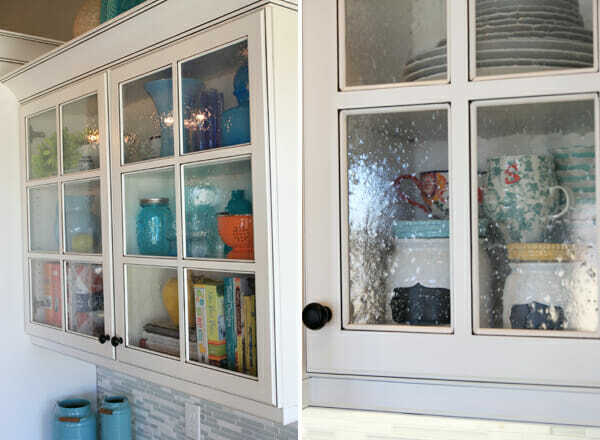 Love the blue glass, I think I’m starting to get that obsession too after seeing how it looks in your kitchen!! Wow, it’s gorgeous! You did a great job! One question… I thought you lived in Utah. No? You said you got the stools on a trip to Utah. Nope, I live in the Boise, Idaho area! We’re just in Utah a lot for business since our publisher is headquartered there. Looks beautiful. What color is the granite? We have similar granite – the name was Delicatus White. I still love it. So beautiful. It all came together so nicely! Loved the spice rack, the outlets in the pantry and the OBB cookbooks on the shelf! You are brilliant. I’m hoping that what we’re waiting to see later is a lift-stand for your Kitchen Aid. I have one and it is my favorite thing in the kitchen. I also have a two-deep trash can cupboard like you do. So convenient for separating trash from recycling! It’s one very gorgeous kitchen, with one very gorgeous woman standing in it (loved the bare feet photo). Great job, Sara!!! P.S.- That is one very ginormous refrigerator! Your kitchen is gorgeous!! I love the pops of blue that come from your glass collection and your tea kettle. And the hidden spice rack is awesome! insanely jealous of your kitchen! Its wonderful! Nice job with the metal tiles, I love them! Absolutely beautiful! I wish it was my kitchen. Oh my gosh. That is GORGEOUS! I love the metal over the stove. Just perfect! Enjoy your super awesome beautiful new kitchen! You deserve it! The outlets in the pantry was really a great idea. I, too, don’t love a cluttered countertop. Considering how fast you put it together I am very impressed you remembered all the details you wanted to add! The natural light from those big windows is beautiful and I love the huge refrigerator. It would be so useful when you need to put large trays in the fridge. Nice job. Gorgeous kitchen! Do you live in Boise? You have the exact kitchen/eating area layout as my cousin who just built a house there. I love how you blended modern and traditional elements. Nice job! 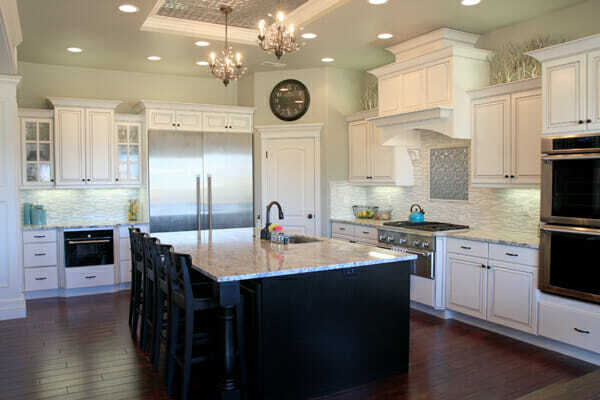 When I one day get my dream house, I’m copying this kitchen completely. I love it that much! um, I WANT THIS KITCHEN!!! every single bit of it. Absolutely beautiful!! 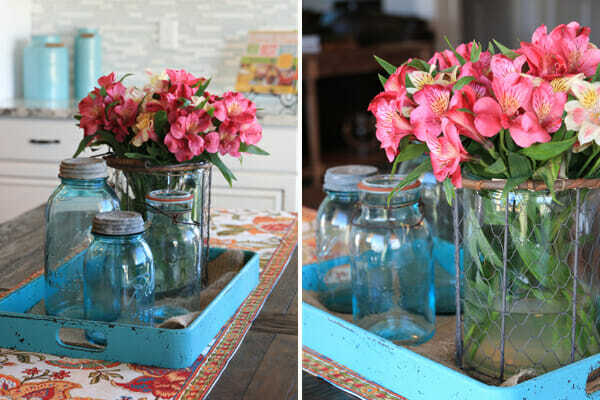 I have the same tray that you have on your table and I love it so I’ll be copying your set-up, so cute! I was curious where you got the table runner, maybe World Market? I’ve been looking for something pretty for summer to add some color and brighten things up and that one is very pretty. I love the hidden storage for the spices! Way to use all the space! Oh it is just beautiful! Congratulations on the new house and gorgeous kitchen!! I am totally jealous! If you don’t mind me asking, I live in the Boise area too, who was your builder? I can’t wait to see what is in that secret door by the garbage door!! Thank you for the peak into your beautiful home! Our builder is Morgan Ririe of Morgan Creek Homes. I can’t say enough good things about him, he was fantastic. If you’d like his number, shoot me an email! Gorgeous! What are the tree things on top of your cabinets? They look awesome! Way to go with the tiles on the ceiling – they make the space. Its beautiful! I love the metal accents and the back splash. Also love seeing your lighting since I bought one of the small ones during the lighting sale as well. Its too small for my dining room….happy to know there is a globe. Congrats! We did our kitchen 2 years ago so I know how much goes into it! LOVE you kitchen! but looking at the photos makes me home-sick for my kitchen back in North Carolina! LOVED my white cabinets (well, cream…). Gorgeous! I’m so jealous of your beautiful space! Wow! Can I be you? Just kidding…It’s lovely, though. Just beautiful! It looks like the kind of kitchen that was MADE for having stacks of pancakes ready on Saturday morning, with bleary-eyed kiddies stumbling in and mom & dad in their robes with a mug of something toasty. Well done!! WOW Sara love your kitchen!!! Who says you cant have too many appliance!! Well my husband. That is one dream kitchen i would love to have!! I dont like appliances sitting around either. Love the idea of putting outlets in the pantry pretty amazing. Love the bar stools! Exactly what I have been looking for! 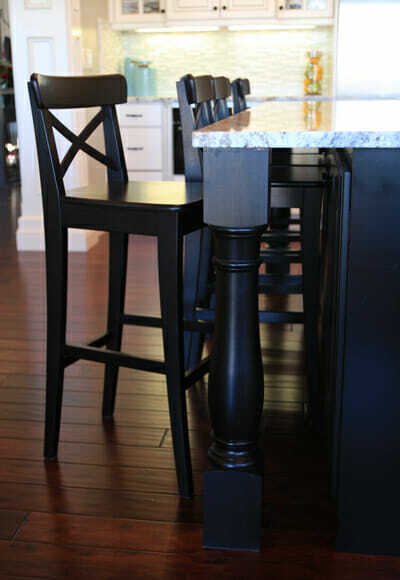 I have 3 little boys so I am thinking maybe I should buy the taller bar stools too. I’m glad you suggested it because I was going to get the shorter ones but the taller ones make so much more sense…no booster seats needed! 🙂 Thanks! Oh and I love the kitchen! And I am really liking your table, might need one of those too! Do you like the bench? Or do you like the chairs better!? I love all the great detail you included. The spice rack idea is so clever. I’m lucky that I’ve been able to enjoy and be in your new kitchen! Lucky Me! It’s just as great, even better, in real life. Congrats on a beautiful new home and kitchen. WOW!totally LOVE you kitchen! Well done! I cleaned model homes and one had the floor you choose in aboout a year from now you’ll be sorry…Love the other look but gives me flashbackes on ice melt on the floor! From the outside being tracked in off the streets..! PS Why didn’t you run a water line for by your stove? I don’t really like the look of a faucet coming out of the wall, plus my sink is literally right there next to the stove. Also, I don’t fill up giant pots of water very often 🙂 As for the floors, ours are incredibly durable and they’ve held up great (snowy shoes, messy boys, and lots of toys!) for several months now. I fill in any scratches with a stain pen and you can’t tell the difference- I’m happy I picked it! I have had those exact same floors for 4 years and still love the heck out of them (dings and all!!) they do shows dust but I actually, like you, don’t mind since they are so easy to clean and it just keeps me on top of it! Love your kitchen, it is gorgeous!!! We have the same backsplash all the way in Texas! Though we did not find ours at Costco. Boo for us! Beautiful kitchen. I might be just a little bit jealous. Love it everyday for the rest of us with slightly below average kitchens. I LOVE your spice jar organizer! I seriously think those are the coolest things ever, and they do save so much space in other cabinets! I hate how unorganized my spices are! I love the kitchen! LOVE the floors. We just put engeneered hardwood in our kitchen/greatroom as well, though its little lighter than yours. I have gone back and forth on putting a rug under the table to avoid scratches. Your table looks great. I think I’ll settle on no rug as well 🙂 Beautiful job. SARA. It is so freaking gorgeous. Imma pin the crap out of it. Your kitchen is my dream kitchen–just beautiful! 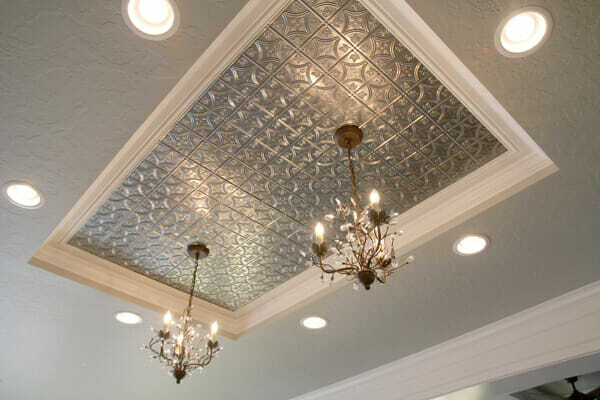 My favorite part…ok of of the many..is the tin ceiling inlay…..can you saw AWESOME!!! And the lights….beautiful. It’s gorgeous. You did an amazing job on the design! I never would have thought of the spice rack or the outlets in the pantry. You’re a genius. Beautiful!! Is the countertop white diamond?? I have that in my house and just love it!! I love it, absolutely gorgeous!! Enjoy!!! LOVE IT! Totally my style. What are the twiggy things above the cabinets? They’re just that- twiggies, lol. They’re white-washed birch branches that kind of sit on a stand. You can’t see the bottom because they’re sunken in- I didn’t have a spot for them so I just threw them up there for now! I love the way it looks. Did you make them or buy them? If so, where did you get them? I’ve been struggling with what to put above my cabinets that doesn’t look too cluttered. This is truly a dream kitchen. Thanks for sharing the pictures. I loved your kitchen – it is just perfect! My favorite features are the lighting and your huge island. Love your kitchen! When we built our new home 3 years ago, I told our builder I wanted a plug in the pantry for my wheat grinder. He though I was nuts. But I have loved it from the day we moved in! I also love my big island, although it’s not quite as big as yours. It’s great for rolling out pie dough, sugar cookies, bread, etc. Can’t wait to read about your appliances! I LOVE your pull out spice rack. LOVE. AWESOME!! what is the branch looking stuff on the top of your cabinets, and where did you get it?? Just lovely! Love white cabinets, the black island, and your choice in lights…where did they come from? 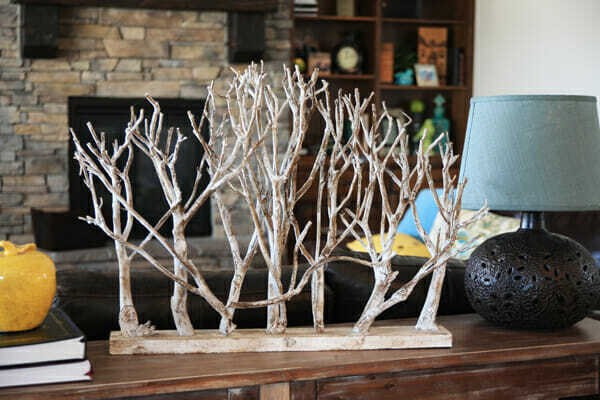 They’re from Pottery Barn, check the end of the post for a link! So gorgeous! 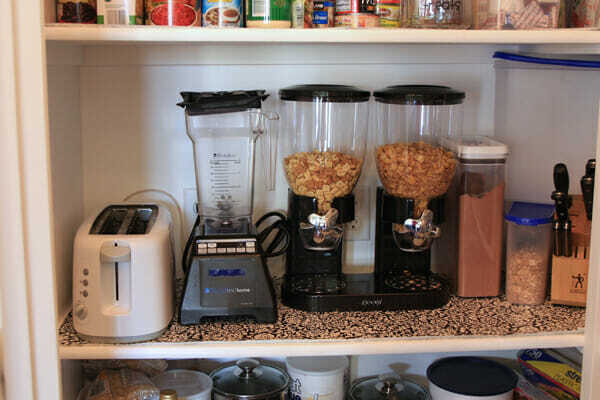 What is next to the blender in your pantry? I can’t tell if it’s some kind of grinder or a cereal dispenser or something else. 2) We have the same crockpot/multicooker! I got mine for Christmas, after I saw it in Real Simple. I’d love to see some recipes using the cooker…Ninja has a great one, too. Your kitchen is wonderful! I just love that the top of the cabinets is a shelf – to leave empty or to display “stuff” that you like. My cabinets go all the way to the ceiling, but my sister has white cabinets with a space like yours, and she has quite a collection of varied pitchers and teapots up there. It’s like a gallery in her kitchen. Beautiful!!! Enjoy your wonderful kitchen. In my former home, I had an amazing kitchen…not so much anymore. I truly miss that 10′ L-shaped butcher block island!! LOVE every single touch of your beautiful kitchen…all the way down to the containers for the cereal!! 🙂 Thanks for sharing!! I always look forward to getting your daily emails! Thanks for all you both do for making our lives a little easier!! Happy Friday!! Wow right out of the magazines…Beautiful! I just love, love, love your kitchen. You are very much like me, except you are probably more imaginative. But we are semi doing our kitchen in our carriage home. We are refacing our white cabinets, actually exchanging them out for maple with a terrific color an glazing. Both my husband and I wanted the tin metal squares as a backsplash where we didn’t have granite. We will do that ourselves or should I say my husband will do it. I wish I had done my stainless steel sink like yours. Since mine is an undermount(granite countertops), it can’t be changed. I have the small sink with the larger sink to the right. That was ten yrs ago, so who knew. Love your appliance idea. I too am an appliance nut. Love gadgets as well. So I have a lot of stuff. Need to extend my kitchen to the other end of the room so I can have more storage space! Have fun in your new kitchen. Beautiful!!! You look so tiny behind that massive island! If it were my choice I would’ve chosen a plate warmer in the secret appliance spot! I hate it when my food gets cold before I can sit and eat it…which, of course as the mom, is usually only after all the kiddos and hubby have everything they need. oooh, I have one of those too! Lol. It’s in another spot- but yes, it’s fantastic! Hello dream kitchen!!! When can I move in?!?! Absolutely LOVE your kitchen. What a dream kitchen!!! I have the exact same floors! And yes you are right about the increased sweeping, but they just add such a warmth and coziness to the room. Have you encountered any scratches yet? My son did a whopper with a hot wheel car that had lost a wheel! Lovely kitchen- congrats on the new home. Erica, do you have a stain pen? We’ve just had a few little knicks but you honestly can’t see a thing after touching up with the marker. I’ll be getting one now. 🙂 thanks for the tip. Those cheap bar towels from wal mart and a little pressure from my bare foot is all I need to wipe up little messes and tracks my son occasionally makes. I have had these floors for a year now and still love them. Beautiful! I’ve been waiting to see this post! 🙂 love your style! Wow, it’s absolutely gorgeous. Love it all! ADORE the kitchen! Wonderful taste you have! I’m in the market for a dining set and LOVE yours. Would you be so kind and tell me where you purchased. Please say a mass retailer (PB, World market etc…) as I am quite far from Boise! Love this kitchen!! Its so my style and similar to what I have right now but WAY nicer!! When we build i am going to do all the awesome extras you have.. so nice! I would love to see a tour of your house inside and out.. that would be awesome, please do!! LOVE this!! 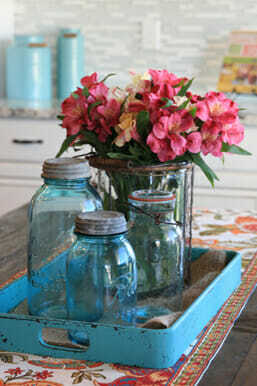 I have been looking for a cute blue tray like the one on your table! Can I ask where it’s from? I love the colors you chose! It’s from Hobby Lobby! I love it so much, I bought it in two sizes (I think they have 3 sizes). I bought that one and a ginormous one that I know one day will be fabulous to transport 87 cupcakes or something, lol! Love the kitchen! Where did you buy your clock above your pantry door? I’m in the market for one and can’t find one I like. I seriously looked EVERYWHERE for a clock I liked and had no luck at any of my favorite go-to stores. Then, last week I ran into my local Fred Meyer to grab a gallon of milk and saw that one so I picked it up. It worked perfectly! What size is the clock you have? Maybe my Fred Meyer only sells the bigger one. It’s pretty big, maybe 24″ across? You have great taste, but that was already clear! I love your new kitchen. Beautiful! Our kitchens are similar in taste and colors! Your countertop even looks the same, ours is called Eagle White, granite. Beautiful job! Isn’t building fun!?! It is gorgeous! I really love that spice storage panel. Someone had a brilliant idea there! Love it! Yes please. Going in my wish book. That is so beautiful, I could cry! You are one super lucky girl! Thank you for kitchen tour. It is adorable. We are doing some remodel work in our house and the kitchen will be then end of the year project. We finally did the lay out last weekend. I love you ideas and how your colors are incorporated. I’m doing white cabinets and dark floors and a table similar to the color that you have. It gets me excited to actually see a picture similar to what I am planning and dreaming. I give up sometimes on sweeping the floors and bust out the shop vac. A few questions do your kids play with your spice rack and what are the cute branch/tree looking things on top of your cabinets? Nope, my kids have never touched the spice racks. They don’t even have knobs on them, so no one really notices they’re there! 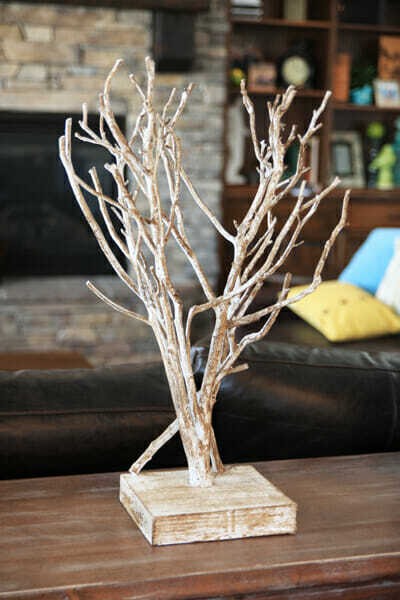 I’m going to post a photo of those branch things in the post today because everyone has been asking! Wow. That is a beautiful kitchen. Thanks so much for sharing the details. I love all the hidden storage and customizations you made. And the colors are just beautiful. One question–do you worry about having the spices so close to the stove? I’ve heard that heat can be bad for spices, but I don’t really know enough about it to be sure. No Kiersten, that’s just a range top above it- my ovens are on the wall, so there’s no heat there. So I know being jealous is a bad character trait…but man am I jealous right now 🙂 beautiful! I absolutely love everything about your kitchen! I would love to see your floor plan, is it available somewhere online? Thanks for letting us all in your kitchen!! It looks fabulous! Can you tell me what the dimensions of your kitchen/dining room are? We are working on house plans and it can be hard to visualize the size of a room. Congratulations on your kitchen:) it’s beautiful and I love the ceiling and stove back splash ~ brilliant! For someone who cooks as much as you do, you need to find and use Penzey’s spices. I have to recommend the shallot salt, French basil, and their Vietnam extra fancy cinnamon. Also, double strength vanilla is delicious if your into that kind of thing. They also make a vanilla sugar (which is kind of pricey) that goes well in recipes that only require a little bit of sugar. Just had to share! Your kitchen is LOVELY! Makes me want to cook just looking at it. Love the dream kitchen! And the colors! I’m inspired. What color is the paint on your island? What I meant to say is what is the name of the color of your black paint on the island? Um…can I live in your kitchen? I would totally sweep your floors everyday! Pretty please? This is incredible; I just “pinned” the heck out of it so that when I get to build dream house, I can use this kitchen! Wow – this is simply beautiful!! I LOVE it all! thanks for sharing!!!! I can’t wait to hear about the fridge because we are in the market for a new one and we have space to get a bigger one—like yours—so please show us every detail of the inside of the fridge and tell us what you love/don’t love so far about it!!!! Beautiful kitchen. I just bought a house and it is going to be a rental property eventually after we fix it up. I loved the color of your walls. I’ve actually been looking for a light grey to put on all our walls. You said you painted the rest of your house a lighter grey. What is the name of the lighter grey you picked? Just one shade lighter on the same chip- the lighter shade is Sherwin Williams “Aloof”. It’s pretty light and I absolutely love it. I LOVE this! Thanks for taking us inside for the tour. I can’t wait for part 2! Love, Love, Love!!! I pinned it, so one day maybe I can do a kitchen just like it!! Love every bit of it. Wonderful job. LOVE it! I’m getting married soon, and my dream kitchen is about the same thing but I’d love to accent in pale yellows and make it all sunshine-y! My sister is throwing me a kitchen shower, and I’m really excited to get some (much) better cooking utensils and so forth. Beautiful kitchen, though, and I love the bench at your kitchen table! Oh, I was wondering how you like your Blendtec blender? And where you bought it? We haven’t put a blender on our registry yet and it seems like so many of them get that burnt smell. I love my Blendtec. I bought mine through Bed Bath and Beyond because you can use their 20% coupon and get the best deal around. Dreamy! That’s all I can say. So very dreamy!!! This is my first time visiting your blog. Wow I have to say, I thought my kitchen was big but yours is huge and beautiful. How fun to be able to create in this environment. I love the ceilings and wish I had your slide out spice cabinets. We made the mistake of having the spices on the inside doors of our cabinets and eventually it ended up causing the doors to shift. So, I had to remove them and put the spices in a different cabinet. Very pretty and it looks qutie functional. I think you identified your second blog and book: Kitchen Design! Way to go. Love your ideas – especially the outlets in the pantry! Your kitchen looks beautiful! Wow! Love how big and light your kitchen is. We’re actually building a house right now and looking for backsplash for our kitchen. We loved yours! I know you said you got it at Costco, was that the one in Boise? And do you happen to have any more information on it–name? color? item #? Any other information you have would be super helpful, my Costco only has the brown tile right now 🙁 Thanks! I’m actually pretty sure my builder bought everything they had, that’s probably why there’s none left! lol Yes, we bought it at the Boise store. It’s the exact same brand and everything as the brownish one (we actually used that one in our master bath). I don’t have any packaging or anything from it though, sorry! I am totally obsessed with your kitchen. We are getting ready to do a remodel of ours and I’m thinking of totally copying almost everything. I was hoping to use more tan tones instead of gray. I saw the tan tiles at Costco and am so glad I read this comment because I’d love to see how they look in your bathroom. Would it be too much to ask to see a pic of the bathroom. Love everything about it. It is so funny because it is everything I never thought I’d want. I never thought I’d like white cabinets and wood floors, but I love it. Well Done! What a beautiful kitchen, and such a blessing that you are young enough to really use it. Lovely kitchen. I love that it feels warm and bright at the same time. I have the same blue platter you have displayed on top of your cabinets. Love it! Thanks for sharing. Getting ready to do a pretty big kitchen renovation…I love your glass and marble backsplash…are you concerned about the grout getting stained near the cooktop? Love it! One question, though. Where is the microwave? Maybe I’m just missing it. Is it left of the fridge under that counter? It’s under the counter, in the island across from the fridge. Do you remember the color of your ceiling tiles? I found them online, but they come in about 18 colors. I’m guessing yours are either, Brushed Aluminum, Argent Silver, Cross Hatch Silver or Galvanized Steel. Also, was the VanDyke Brown on your cabinets, only in the recessed areas? It looks that way, but I know sometimes lighing and flash can be deceiving. We are in the process of remodeling and you and your kitchen have given me lots of inspiration!!!!! Never mind on my above question about the ceiling tile color. I was looking at the faux tiles and not the real metal ones. Was the VanDyke Brown on your cabinets, only in the recessed areas? It looks that way, but I know sometimes lighing and flash can be deceiving. Yep, the van dyke is what you see just in the crevices where you see that dark line. Hello! Love the kitchen, it’s totally my style and I’m sure you are enjoying it! It looks like you don’t have an exhaust fan over your stove. Is it hiding somewhere or did you just not want one? No I do have one! It’s just hidden under that woodwork above the stove. Those cabinets are amazing. I am also wondering how the stain/paint was applied to achieve that effect. Must have been incredibly time-consuming, but they look fabulous. Basically the cabinets are painted and after they’re dried, a glaze is rubbed over them. A special solvent used to then wipe them clean, but the glaze will stick in all of the crevices. I am in the process of building a home. I appreciate all your detailed info for your new beautiful kitchen. I have been frustrated trying to keep all my building info organized. I have pinterest boards, secret boards, houzz boards, loose papers, and all kinds of craziness going on. I have yet to find a way to organize it and be able to make notes and add info as the building process moves along. I would love a digital format, but maybe an old fashioned binder is my only option?? Did you have a great way to keep your files organized? Would love suggestions! I honestly didn’t have files of any kind. A sticky note here or there, and piles of random papers in my office, haha. The whole building process was pretty quick for us and we made a lot of decisions on-the-spot simply to avoid papers! My mouth literally dropped open! So gorgeous! BEAUTIFUL! 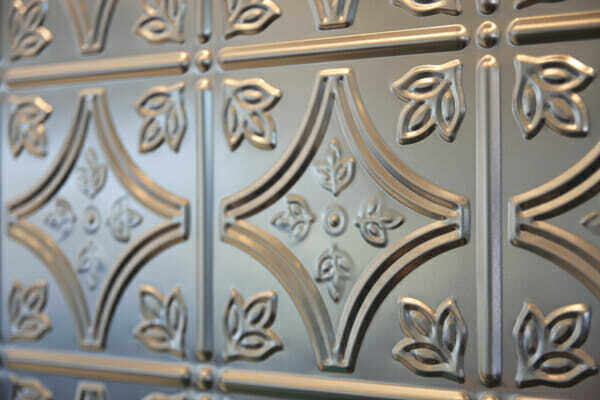 What finish did you use on your metal tiles? This is seriously an incredible kitchen. I am thoroughly jealous to my core. I love to cook and that massive amount of space with great access to everything I could need nothing more. I think you did a great job with this and that ceiling above the island is something special. Congratulations on creating something most could envy. I am in Idaho, too, and was wondering if you could tell me which plan you used from Morgan Creek. I got onto their website. Did might have just done a custom home though. Beautiful kitchen!! My floor plan isn’t on Morgan’s website, sorry! I love your kitchen, it’s my dream!! I am getting ready to build and have been looking at your builder and was wondering which house plan you used??. I really like the layout of the kitchen. Thanks so much! Sorry, our house plan isn’t one listed on his website. Thank you for inviting us into your kitchen! Who was your builder? Thanks! I just saw the sidebar with your kitchen tours and was SO EXCITED! Your kitchen is so gorgeous!!! Love all of your choices! I have the hand-scraped floors as well (mid-tone bamboo) and they are PERFECT for hiding scratches and dings. Love, love, love. LOVE your kitchen! I’m in the process of ripping up our tile and putting in wood floors. I have scoured the internet and asked lots of flooring people if they can help my find the Santa Ana floors you have. No luck…no one has heard of them and I can’t even find them online. Any chance you have the name wrong? Maybe it’s unique to RC Willey but I would REALLY love to find your flooring since it’s exactly what I’m looking for. Thanks! Hmm, that’s weird. I would contact someone directly with Mohawk and start there. They might make it specifically for RC Willey but I’m not sure. I do know that’s the right name though, I called and got all the info! Haha, nope- not creepy at all. A lot of people say that and the feeling is mutual! We’re totally friends! lol Good luck on your flooring search. Really, you should just call the Boise RC Willey store and ask for Troy in flooring. He’s a friend and will totally help you out. Just tell him you want the floor from Sara Wells’s kitchen and he’ll give you the model number and everything- no joke. That might be the fastest solution for ya! I called Mohawk and just wanted to let you know in case any one else asks you the same question…stores can take the Mohawk product and name it whatever they want and even change the numbers so it can make it impossible to find the same product at a different store or online. I live in AZ so no luck getting it from RC Willey but I appreciate your help! K, so I know this will probably sound weird, but we are building and I knew that I wanted the walls if my home to grey, I have had paint swatch after paint swatch and the I took your kitchen tour and went to Sherwin Williams and your color is my fav! So my question is, how did you find an attractive carpet that the paint and carpet compliment? We are doing hand scraped walnut hardwoods in the living room, kitchen, office, and hallways, but for the bedrooms and family room, I just can’t come up with a nice carpet option. Any suggestions? I’ve been looking for the metal tile you used from Home Depot. I think I found it except it’s being sold in 2X2 sheets now. It comes in a bunch of finishes – bare steel (for self finishing) white, clear lacquer, brass, copper and chrome – which one did you use? Thanks! My kitchen is getting close to being finished, and then off we move to Utah. I think 13 families are moving from the ward in the near future. : ( You would hardly recognize anyone anymore. So sad. Did you customize your floor plans or did your builder offer you some. We are moving to Idaho Falls and are going to build. I have been searching for the perfect floorplans and I love yours! We customized a plan our builder designed. Your kitchen is amazing! I was wondering how far your island is from your cabinets/appliances? thanks! Hello. I am wondering what is the species of your Hardwood Floors? I read on this blog where the “name” of it can be changed, however if I could find out the species, then that would help me find it. Thank you so much. We have RC Willey here, but I can’t find that name. Thank you so much. Look up the Boise RC Willy store and ask for Troy in Flooring. He’ll be able to tell you exactly what I have and help you locate it at another store! Hi again. Okay I called Troy at the Meridian, Idaho RC Willey. He said at the RC Willey store it is called Santa Ana Plank 40 Saddle. The order number from RC Willey is WEK5-40. WEK5 is the style and 40 is the Saddle color. On the Mohawk website it is called Santa Barbara, but we could not figure out which color name for sure. There is a Light Amber or Dark Auburn Maple color that look similar to yours. He said the wood species is American Maple (Engineered) at about 1500 on the Janka hardness scale. He was very helpful. And, by the way, Sara, he said you owe him a cookbook:). Thank you for your website and blog!! What color is Sara’s kitchen floor? IS it oak or Maple? Thank you love the kitchen!! Can you share the specific tile you purchased at Costco? I have looked on their website and can’t seem to find it. Maybe they do not have it anymore, so if you could share the item numbers or name I may be able to track it down somewhere else. It is the perfect backdrop to your amazing kitchen!! Also, how wide is your pantry door and did you order extra crown molding from your cabinets to trim it out? Thanks in advance for your response!! I’m sorry Heather, I don’t have any info on the tile. It was just something only one of my local stores had for a limited time. Our pantry is just a standard size door and all of our woodwork was custom. I am wondering where you got your dining table? I love the bench and chairs combo! ha! never mind, i see its from world market! I have a 9 month old scaling my legs right now, so I just quickly scanned the page! This is gorgeous kitchen. I love your flooring and lightning. Paint colors are amazing! Every details of the kitchen complement each other. Your kitchen is amazing I wishI had the same! 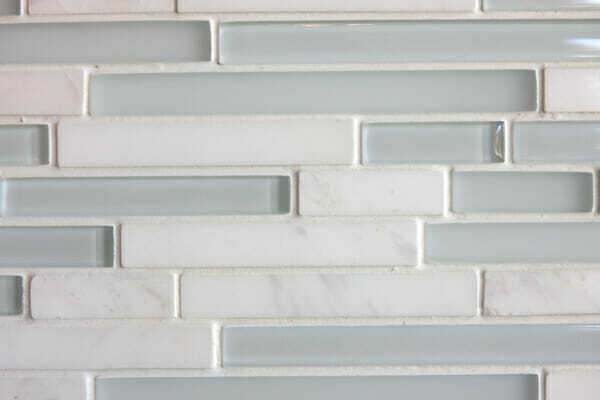 Hi Sara, I love your tile and glass backsplash and noticed you got it at Costco. I was wondering what the name of it is? Thanks! I’m really not sure- sorry! It was just a local thing too, so I’m not sure if you could find it, you’d have to check your local store. I could’t see where or if you posted your granite. The thread is quite long:) Do u know if it’s white springs or white ice? It’s very similar to White Ice. Hi we are just starting our new build and I really love this granite. Happily I am only five hours from Boise so I think that I can get this granite around here! Can you please tell me where you got it and the different names it goes by. I think you said there were a few names. Thanks so much. Gorgeous kitchen. Also, do you have a take on quartz countertops? quartz is definitely trending right now. I think it might be the “in” thing in the coming years. I looked at it quite a bit, but I just didn’t think it looked very nice. It’s a little more modern- but some of it just looks like formica to me so I went with granite. I’ve seen some really nice kitchens with quartz though, so I think it’s a good option if you find one you like. Can I buy the Arcadia bench from you? I just bought the table and the bench is completely sold out. Let me know please! How high is your ceiling? It looks like 10 feet…?? We are starting to build and our plans call for 10′ ceilings. Which seems really high to me. Does it ever feel too high? Yes, they’re 10 feet in the kitchen, and it’s not too high. The surrounding rooms are actually 12 feet and for me, the higher the better! this kitchen is GORGEOUS! That camilla light is so intriguing!! I can only imagine how amazing it looks when it is on. we are in the process of building and I came across this picture. I LOVE your kitchen and am using it as an inspiration for mine. I was wondering what size you did the recessed ceiling and why you chose it? Thanks! Beautiful!!! Yes, it does look pretty. I guess I meant why you chose those dimensions. 🙂 thanks for answering my questions. My mom and dad live in the Caldwell, ID area and are looking for similar pot lights that you used in your kitchen. Can you give us your Boise source? Thanks for sharing…so many great ideas that we will incorporate into their new kitchne. 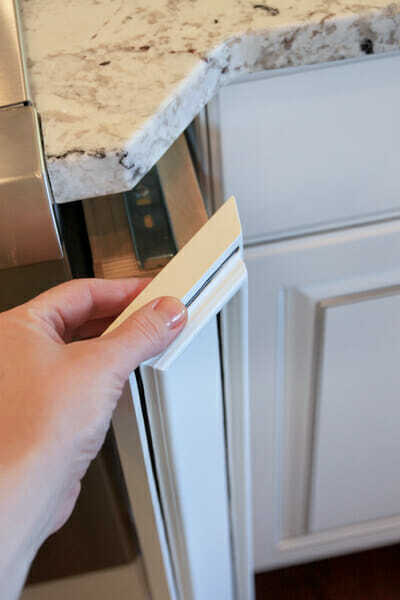 What color white did you do your pantry door and trim? It’s the same as the cabinet color, listed above. A beautiful kitchen! Now that you have been in the kitchen for some time it it still as functional as you had hoped? Would you change anything? Talk to me about your sink being in the island. We are building and right know that’s when the sink is located? Do you have issues with piles of dishes on he counter, because no one else a see to wash them or put them away? Hope this kitchen is as functional as it is beautiful! I see you are in Boise. Does your husband builder/cabinet guy own his own business? 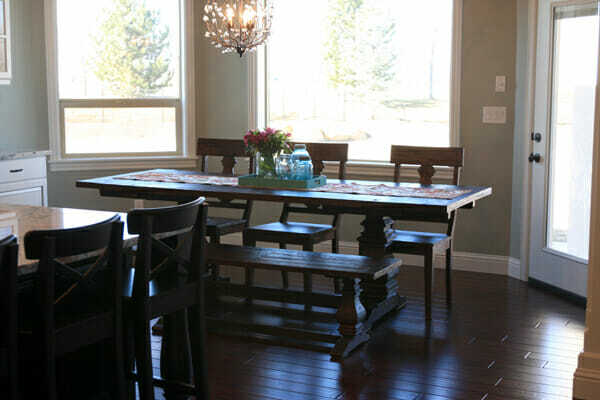 I found your blog while looking for cabinet faux painters and refinishers in the area? I want to update my kitchen look and love what you have done here. Linda, email me and I’ll shoot you his contact info. Beautiful kitchen!!! I would love to see a picture of your living room and entry. Love your taste in food and kitchen design/colors!! Love the kitchen. What is the size of your kitchen without the breakfast nook? I love your kitchen! What is the name of the paint color on the walls? It is so pretty. I looks like it has a hint of green in it. This is the most amazing kitchen that I have ever seen in my life! The amazing detail and the breath taking chandeliers! <3 This is 100% my dream kitchen! How do you like your Blendtec? I’ve been using my blender a lot now, and I have a ninja which I thought would be fine, but I really don’t love it. I can get a blendtec for under 300 at Costco right now, so am seriously considering returning the ninja. I’ve heard great things about blendtec, but don’t want to go crazy and get a vitamix. whoops! I just read through more comments and see you already answered. Thanks! Love my Blendtec. I literally use it every singe day for something! This might seem like a strange question… but I’m planning our kitchen for our house and am curious: what are your walkway widths in the kitchen? Island – Refrigerator / Island -rangetop? And do you like the width??? You mean between the island and those things? It’s wide, probably 4-5 feet. We specifically made it so things could be open (fridge doors, dishwasher, etc.) and still have 2 people pass by each other. JUST CAME ACROSS THIS! YOUR KITCHEN IS BEAUTIFUL AND THANKS FOR ALL THE ADDED MATERIAL COLORS AND SUCH. I’M IN THE PROCESS OF BUILDING AND I CAN’T DECIDE IF I WANT TWO TONED CABINETS AND ISLAND. WE HAD DARK CABINETS AND A WHITE ISLAND IN MY LAST HOME AND I HAVE BEEN PLANNING ON DOING ALL WHITE THIS GO ROUND. WHAT COLOR IS YOUR ISLAND? I’M REALLY LOVING THAT LOOK! THANKS! OH AND ALSO, DID YOU DO ALL YOUR TRIMS AND DOORS IN THE “SNOW BOUND”? I am building a house right now and found your information super helpful. Love your kitchen! I have been looking into Thermadore appliances and electrolux. Do you like your Thermador? I have read a handful of bad reviews…..
Crazy! We just finished building in june of 2013 and my kitchen has many of the same components and I love it too. 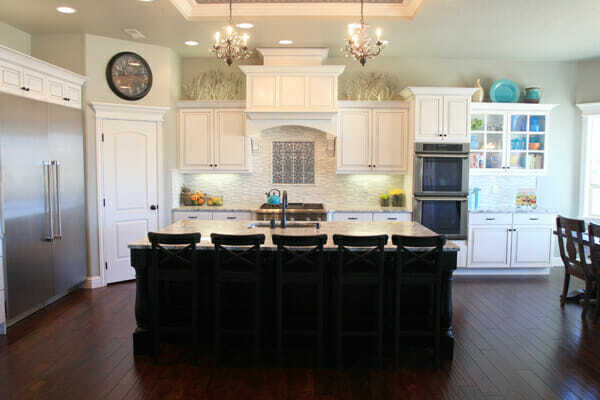 We did the white cabinets as well with the contrasting walnut cabinetry on the island. Same double ovens, same full size fridge/freezer (which we LOVE since we have a large family and eat lots of fresh), same skinny spice rack next to the stovetop, glass backsplash tile, gray engineered granite, gray walls. 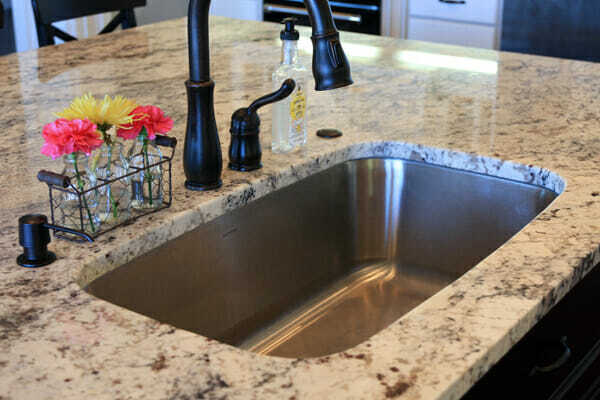 Like you, I really wanted the undermount sink with no dividers, but also loved the apron front farmhouse sink so we found one that combined the two. I have loved it! Same stone fireplace and built in walnut book shelves next to it. Lol, I had no idea the concepts were so popular among others as well since we designed it all ourselves, too. But that makes me feel better that we probably weren’t too far off. We did decide to do real hand scraped hickory floors for this house; but we put into our last house the exact same engineered stuff that you have. We had it for 2 years, and while there were occasional knicks in it, overall I thought it did very very well and it was definitely more affordable than real hardwood so I think you will continue to love it! Oh, this kitchen is PERFECT!! We are just beginning a kitchen remodel, and I’ve searched and searched for pictures of what it is I have in my mind. I’ve looked at hundreds and hundreds of pictures in magazines and Houzz.com — NOTHING has come as close to my imagined kitchen as yours! I first found your blog simply because I was searching for what is already established in the plans for my kitchen: 9′ x 5.5′ dark-stained or painted island; white cabinetry, one glass cupboard space, and single-basin undermount sink. My google search brought me directly to your page! Totally amazing kitchen!!! How the Arcadia table and chairs are? 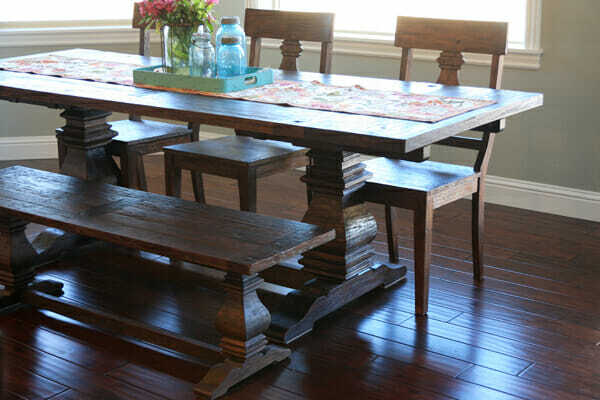 I’m thinking to buy this table and chairs, but I don’t know if the are a good material! Can you please tell me your comments about it. Thank you! 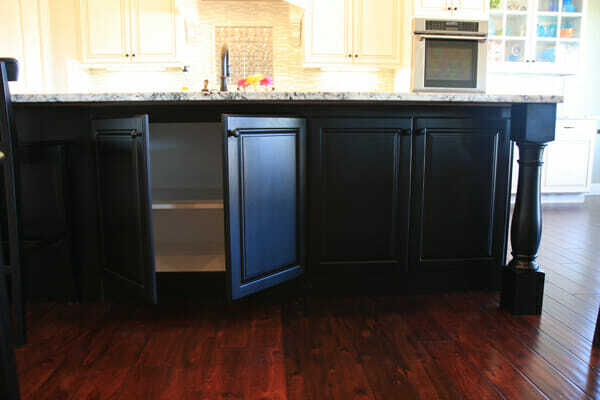 Our cabinets were custom designed and built for us. Sara, such a perfect and lovely kitchen! Can you please tell me if –given the size of your island– were you able to find a slab of granite large enough, or is there a seam? If there is a seam, would you mind divulging where it was placed, and how the placement was determined? Thank you in advance–I appreciate it! What a gorgeous kitchen Sara! I loved that pantry! I am building and I was wondering if you could share with me the measures on that pantry. Thank you a lot! Beautiful! 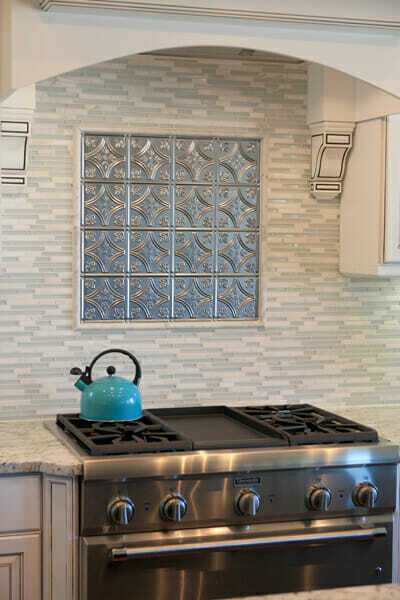 Can you tell me what color of tin tile you used for your oven backsplash?Was is Chrome or unfinished steel? Thanks so much! I just read every question and answer in the comments hoping I would find the answer I was looking for and not waste your time but… I saw it asked but I didn’t see the answer. Do you know the dimensions of your kitchen and island and is there anything you wish was different? I too am building a house and trying to make sure I get the kitchen right! Thanks! Can you tell me the size of your sink and also the color of the island? Also, is it a 12″ overhang? Absolutely beautiful!! Looking at putting a Thermador kitchen…just wondering what temp the warming drawer heats to? I am looking for something that I could “rest” BBQ meat in at around 140…could you do that in the warming drawer or does it not heat that high? Beautiful kitchen! I am wondering how tall the kitchen ceiling is above your island? Do you have problems using such a light marble? I would love to put a lighter colored marble in the kitchen, but am afraid it would stain or watermark with heavy use and look unattractive. Did you polish and seal your marble, too? Hi Sara! 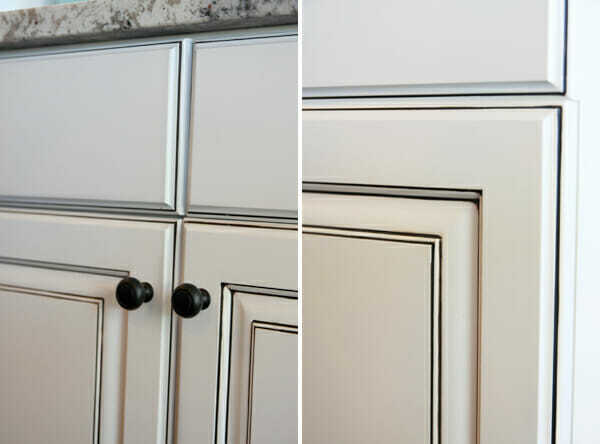 I looked throughout your posts to find the answer… What sheen is your cabinet paint? Did you use a flow-leveling additive, to minimize brush strokes. I just painted my doors and the paint is too glossy and have tons of brush strokes… THANKS, I just don’t want to make the same mistake with the kitchen cabinets. I was wondering where you found the glass on your cabinet doors? Came across your recipe for Oreo Turkeys, which let me to your website. After copying all your Kids Recipes (my 7 yo grandson and I have a tradition of making or baking different recipes & crafts when I visit him 4-5 times a year. He looks forward to doing this with me, than expecting toys (though I only buy him educational toys!) … this led me to your website … and eventually to your kitchen tour!! Lovely!! Eventually I will combine my kitchen with my small dining room next to it (and building a large dining room off our house), making one long rectangle kitchen, so been gathering ideas for a year now. Your spice rack pull out cabinet seems to be a real hit here … and I couldn’t read through all the comments right now, so hope I am not repeating … but does really hold 4792 spice bottles … or is this a misprint?!!? That is a LOT of spice bottles! As for your very large clock someone asked about. If anyone has a Big Lots or Odd Lots near them, they usually carry a lot of large styled clocks like this …. PS I liked you on Facebook … and added the Oreo Turkeys to my Pinterest page of Kids Recipes!!! Forgot also to say I copied your ideas of one large deep sink, the spice pull out cabinet & the deeper shelves for ideas for my new kitchen when we remodel it. I also noticed you did not do roll out shelves in your lower cabinets … wondering why? My daughter has a very large kitchen like this with the large island in the middle w/cabinets below … which only has a raised section at one end with only two stools and a small bar styled sink w/another garbage disposal in it … and she just re-did her lower cabinets with the roll out shelves … she loves them, so do I and I will be putting them in all my lower cabinets also. Thanks!! I LOVE your kitchen. We are building a new home in a few months. A big, functional kitchen is a must. But we’re having a hard time visualizing how big of a space that would be. Would you be willing to share how big your kitchen is? I love your kitchen! I’m remodeling our kitchen and I’m using a similar color scheme with white cabinets, white granite or Carrera marble with some blue accents. We are putting in Thermador appliances and I had a few questions. Did you purchase the baking pans made by Thermador that fit perfectly in the Convection Steam Oven? Do you use the convection feature on your warming drawer? 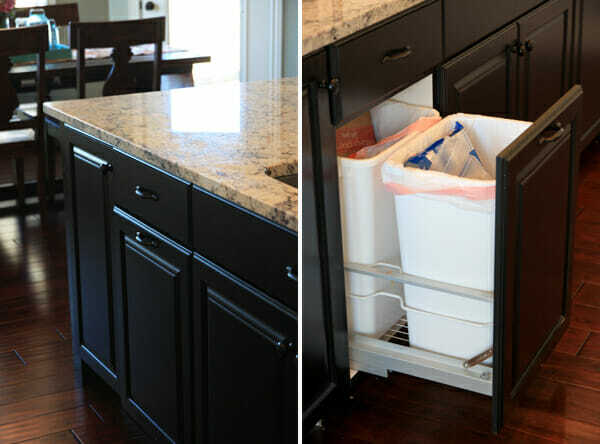 Are you happy you went with a custom cabinet on your dishwasher? I have an appointment to choose my Thermador appliances later today. Thank you. I just have the pants that come with the steam oven, and they were great. I can set a normal baking pan on top of those, so I’m not sure about the ones you were talking about. I’ve been happy with the cabinet on my dishwasher, it looks nice and I haven’t had any problems. Hope that helps! I love your kitchen! My husband I are trying to figure out what type of wood your cabinets are? Where did you get your kitchen table? I love the trestle base. It’s the Acadia table from World Market. I love it!